The Brussels-based Razen make experimental and minimal music with unconventional instruments, focusing on tuning, intonation and the use of intervals. 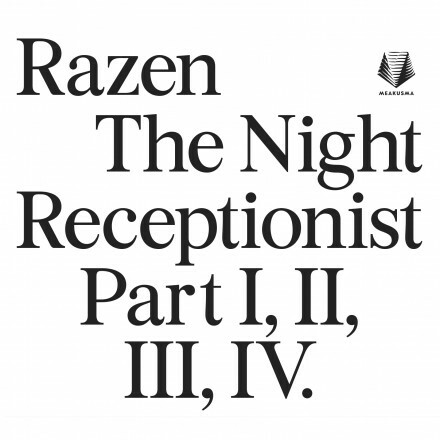 Their The Night Receptionist album sees them working again with performance artist and poet, videographer and self-portrait painter Bryan Lewis Saunders. Recorded during a two-week residency at QO2 in Brussels in 2016, The Night Receptionist employs a just intonation system based on the tonality diamond of Harry Partch. The instruments of choice were sarangi, double bass, recorders, shawm, monochord, santur and a selection of hommels. disenchantment, recounting the story of a failed gymnast turned night receptionist, wishing for acts of anti-gravity and catching salamanders. It is music for the early hours of the morning, music that explores the undercurrent of thought processes on the threshold of deep sleep.